I hope you’re enjoying your weekend, and are able to get some stamping done 🙂 If you’re in the mood for making a card that’s a bit more work, today I have an Easel Card to share with you. An easel card is quite easy to make; it just takes an extra couple of pieces of cardstock, and a different way to put them together. For this card, I chose to use the Hearts Come Home Bundle, which includes the Hearts Come Home stamp set and the Hometown Greetings Edgelits Dies. By purchasing the Bundle, I saved 10% Off the combined price! First, you’ll want to create your card base. I used Thick Whisper White cardstock, so it would hold up well to the weight, and standing up. Your base will be 4 1/4″ x 8 1/2″, with a second piece that measures 4 1/4″ x 4 1/4″. Score the 4 1/4″ x 8 1/2″ piece at 4 1/4″ and 6 3/8″. Fold on the score lines; first, fold the piece in half, then fold the smaller piece the opposite direction. Next, attach Tear & Tape to the back of the 4 1/4″ square piece, and attach it to the short, upwards facing piece of the main card base. Your card will look like this, from the side. Be sure you’re attaching the TOP of your 4 1/4″ square piece to the base! It’s really easy, honest! If you’d like a quick video tutorial on putting it together, there’s one on Splitcoaststampers – a great resource! I took a 4 1/4″ x 4 1/4″ piece of Soft Sky cardstock, and used the Softly Falling Embossing Folder and ran it through the Big Shot. Then I attached it to the base with Multipurpose Liquid Glue, and glued a 4″ x 4 1/4″ of Soft Sky cardstock to the inside, where the sentiment will be placed. 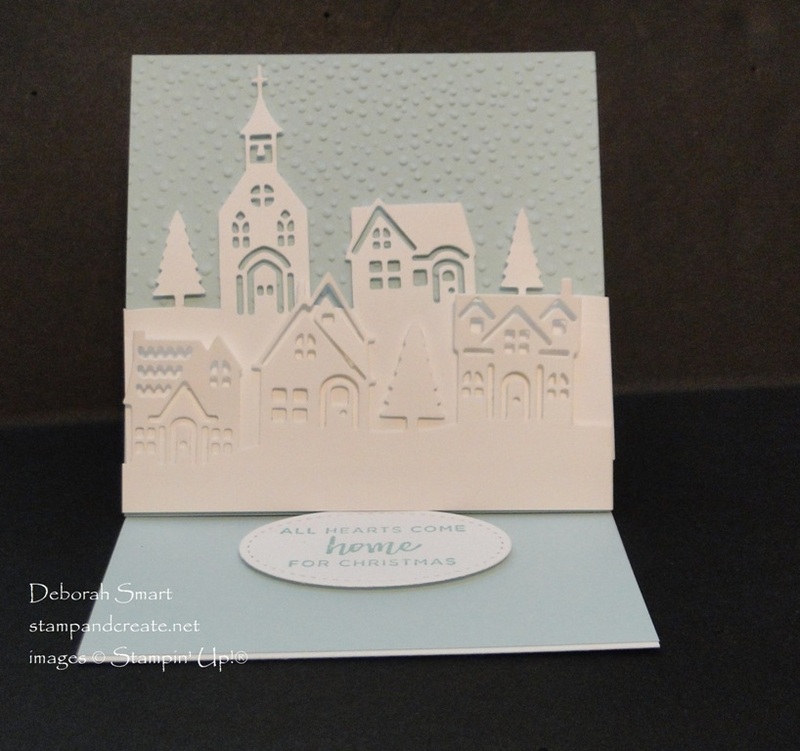 For the focal area, I used the Hometown Greetings Edgelits Dies with the larger houses and the church, and die cut from Whisper White cardstock – regular thickness. I then layered them, one in front of the other, onto the embossed Soft Sky panel, with Stampin’ Dimensionals. Of course, you want your easel card to be able to stand open, so you need to add something to the base that will do the job! I stamped the sentiment in Soft Sky ink onto Whisper White, and die cut it with the Stitched Shapes Framelits. I placed it about 1″ from the bottom front of the panel, with Dimensionals. This leaves plenty of room for writing and signing the bottom panel. 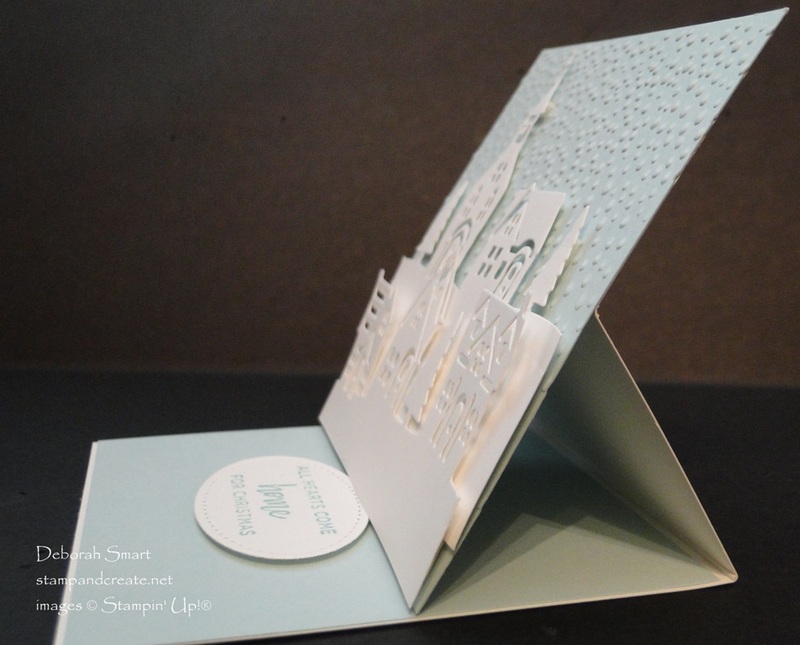 Easel cards are so much fun, because you can get really creative with them! I have some more examples you can see, in previous posts HERE, where I created one with a tea light candle behind the easel portion, and THIS POST where the easel part is a shaker! I hope that this card, and my previous ones have given you some inspiration, on the World Card Making Day! To order any supplies you need, you can either click on the images below, or on my signature, to order from my online store. It’s open 24/7, so you can shop any time! Don’t forget about my amazing FLASH SALE – I’m offering 10% off the framelits/thinlits and Daisy Punch that coordinate with the stamp sets that are currently on sale at 15% off! If you haven’t seen it, you can read all about it in THIS POST. I’ve even partnered with my good friend and SU! demonstrator Susan Horr in the U.S., so that my American readers can get this deal, too! 🙂 It’s only on until Tuesday, October 10th – so HURRY and ORDER NOW! Previous Previous post: Special Offer Just for You! Beautiful card, Deborah! I just got the framelits and I can’t wait to try them out.